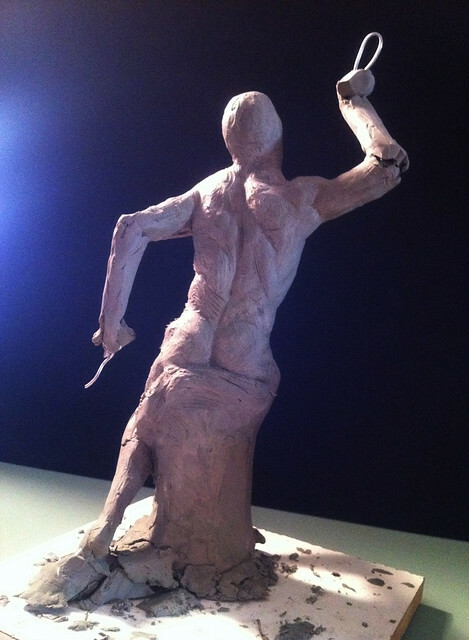 On Thursday nights I sculpt with a group of friends who are passionate about studying the figure and sculpting. Recently, when we set up our model, Jennings, we decided that the poses he was gravitating toward reminded us of "The Loacoon". 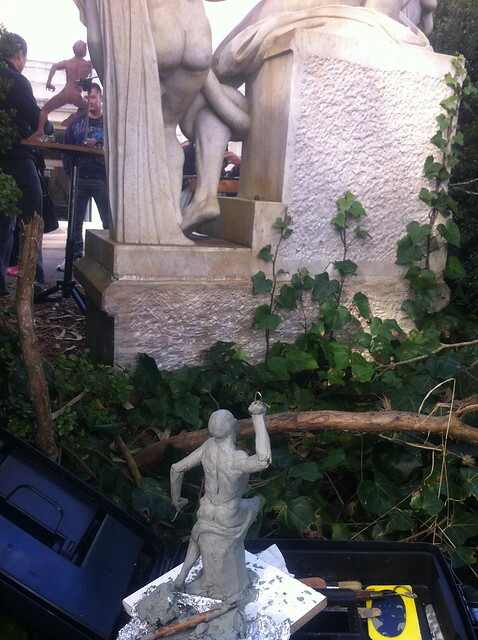 We decided to go with it and have our fabulous model take the pose of the famous sculpture. 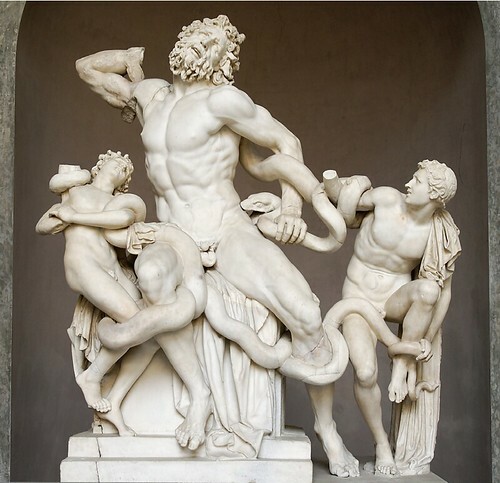 The Laocoon comes from the Hellenistic Era, about 50 BC, when Greek sculpture evolved from a rational and classic art into a passionate and emotional expression whilst still retaining the idealization of the human figure. The group depicts a scene described in Virgil’s Aenid. 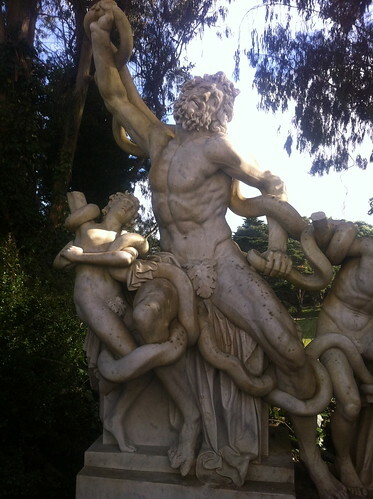 The Trojan priest Laocoon and his sons are set upon by serpents at Poseidon's command as punishment for Laocoon warning the Trojans against the wooden horse. Three sculptors are credited by Pliny to have sculpted the group: Hagesandros, Athanadoros and Polydoros of Rhodes. The sculpture was lost until it was discovered on January 14, 1506 during an excavation in a vineyard of Felice Fredi at “Sette Sale” on the Esquiline hill in Rome. 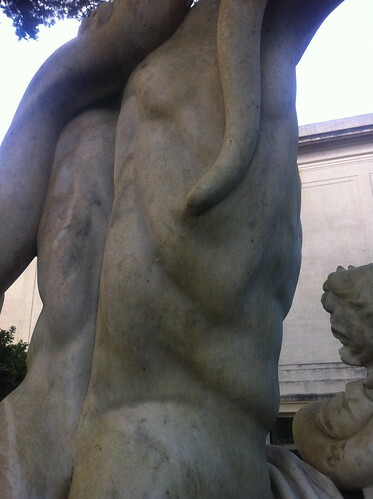 When the sculpture was found, the raised arm was broken off. Michelangelo believed that the missing right arm was originally bent back over the shoulder. Others believed it was more appropriate to show the right arm extendeded outwards in a heroic gesture. The Pope held an informal contest among sculptors to make replacement right arms, and the contest was judged by Raphael. 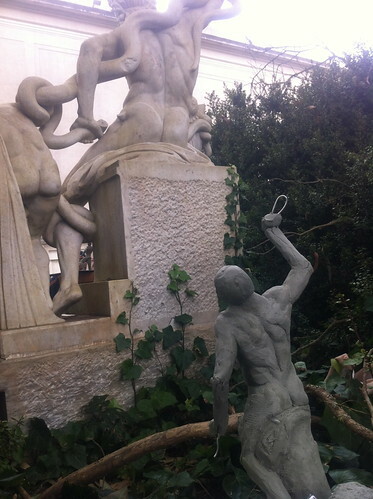 The winner, in the outstretched position, was attached to the statue. In 1906 a fragment was discovered and believed to be the original arm. This arm sits on the statue today. Pope Julius II placed The Loacoon Group in the Vatican where it still resides. Many casts were made of it subsequently and acquired by museums around the world. 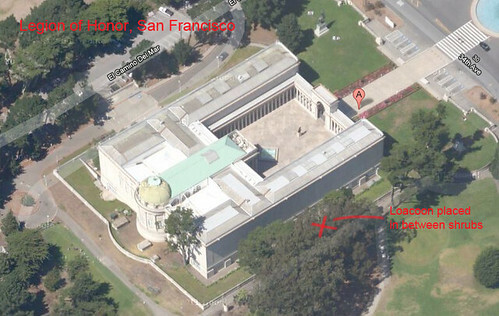 One of those casts sits just outside the Legion of Honor Museum, tucked away on a quiet path, making it accessible for study. Our Thursday night poses are typically set up for six three hour sessions. We decided that when this pose was over, we'd take our sculptures to the real Loacoon and work from the actual sculpture for comparison. 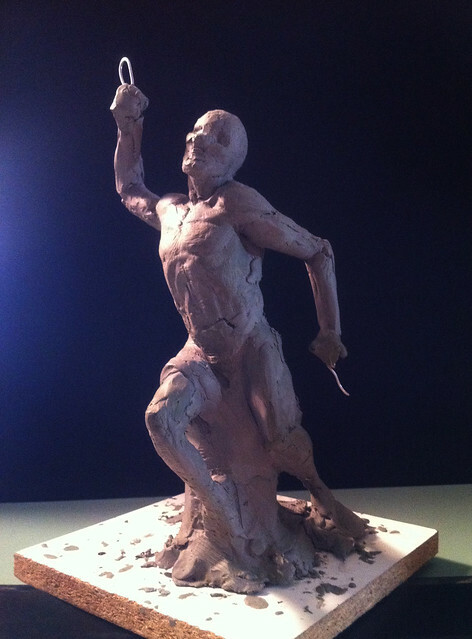 I found that when I sculpted my block in from the live model, I interpreted the muscles of the back VERY differently. The back muscles I sculpted from our model Jennings were anatomically correct and logical but not simplified or idealized in a way that communicates strength and agony. My block in did not communicate this essential truth of the original and was merely an unemotional study of anatomy. In addition to the enlightening exercise of sculpting from life and then from the actual sculpture, I found sculpting outside to be incredibly FUN. With a few careful preparations and perhaps fingerless gloves to keep hands warm, it would be possible to sculpt other outdoor studies of other sculptures in order to learn how to interpret and idealize the form. Practically speaking, an artist must come prepared. Blocking in the figure ahead of time either from the live model or photographs is helpful and necessary. Once there, you can use your hands to warm up small bits of clay and add to or take away as necessary. We used our plein air painting boxes placing our studies on top of our stands. 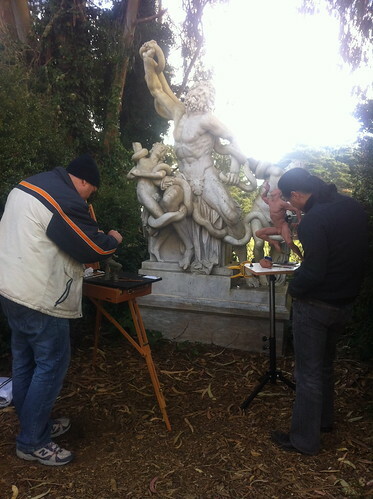 My friend Lenny used a sculpting stand called "Hercules" that he recently bought, which seemed like a great option for indoors and out. ***A note, however: although the stand is called "Hercules", it has it's limits regarding strength. The bolts at the bottom of the tripod are not strong enough to withstand heavy weights, I'm guessing over 50 pounds. However, for smaller works it is fantastic. 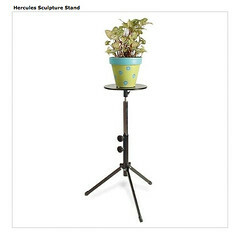 The top has a rotating base that you place your board and sculpture on which sits upon a tripod, making it easy to transport or put away in a closet when not in use. After I got home from hours outdoors and defrosted my frozen fingers, I took a long look at my block in. Before we went to sculpt the original sculpture, I knew something was not working in the torso and back, but I was unsure of what. After seeing the original sculpture live, my vision became more clear and my understanding about what to aim for about the entire piece understood. A sculpture (or a drawing or painting) is not about the individual muscles but about the whole. Each area is important and can be idealized, but it makes no sense if the gesture is not working. All of those individual muscles will be meaningless if they are not working together to communicate the idea. In addition to the gesture and over all idea of the piece, there is an enormous amount to observe and learn about how to idealize various areas of the body. It is unlikely that one particular model looked like this man. Rather, several models were used for various areas and each form made to be "the best" way to depict an area of the body. There is so much information in this one sculpture group to learn from. I will continue to work on my study of Loacoon here and there over the next few months bringing my block in with me to study the idealized figure. This will be a long term project, taken in slowly, allowing the beautified form to seep into my consciousness a little at a time. For drawing practice and sculpting study and reference, I may also purchase this Mask of Loacoon's head.